Posted June 11th, 2015 at 9:45 am. Bryn Mawr Assistant Professor of History Elly Truitt’s new book Medieval Robots recovers the forgotten history of fantastical, aspirational, and terrifying machines that flourished in the Islamicate world and Byzantine and Mongol empires, and that especially captivated Europe in imagination and reality between the ninth and fourteenth centuries. In the book, Truitt traces the different forms of self-moving or self-sustaining manufactured objects from their earliest appearances in the Latin West through centuries of mechanical and literary invention. Chronicled in romances and song as well as histories and encyclopedias, medieval automata were powerful cultural objects that probed the limits of natural philosophy, illuminated and challenged definitions of life and death, and epitomized the transformative and threatening potential of foreign knowledge and culture. 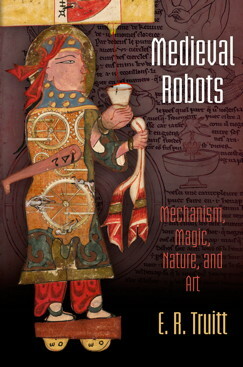 This original and wide-ranging study reveals the convergence of science, technology, and imagination in medieval culture and demonstrates the striking similarities between medieval and modern robotic and cybernetic visions. At Bryn Mawr, Truitt teaches courses on networks in the Middle Ages; medieval science, medicine, and technology; intellectual history, including the history of magic; and courtly culture. She is currently working on several projects, including an article on translation in Chaucer’s Treatise on the Astrolabe, a new translation of a work by Roger Bacon, and a book about Roger Bacon’s theory of technology. To learn more about Truitt, see this feature done when she joined Bryn Mawr’s faculty. Medieval Robots is also available through Amazon.